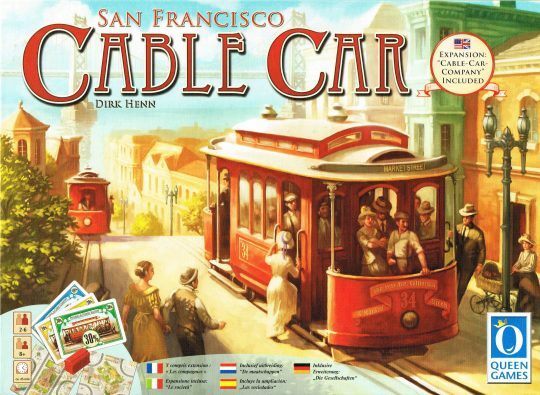 Cable Car is a reworked rerelease of the game originally published in 1997 by db-Spiele as Iron Horse and in 2000 by Queen Games as Metro, with a different theme, new artwork and the components and rules to play the new, optional variant “Cable Car Company,” which introduces stock holding to the game. Players place square tiles onto the board to form rail lines. The object of the game is to make the rail lines as long as possible. Players start with a number of cars ringing the board. When a tile placement connects a car to a station (either to those on the edge or to the power station in the center of the board), that car is turned to indicate it has been scored and the player scores one point for each tile that the route crosses.